Experience an up-close and personal connection with year-round whales, dolphins, sea lions, and more aboard Capt. Dave's eco-friendly whale watching vessels. Whether it's a leisurely cruise aboard the sailboat catamaran, Manute'a, with exclusive Eye-to-Eye Underwater Viewing Pods and three Eye-Spy Tram Nets, or a super speedy adventure on the GoPro-friendly zodiac catamaran, Fast Cat, with a small group of 12 passengers or less. 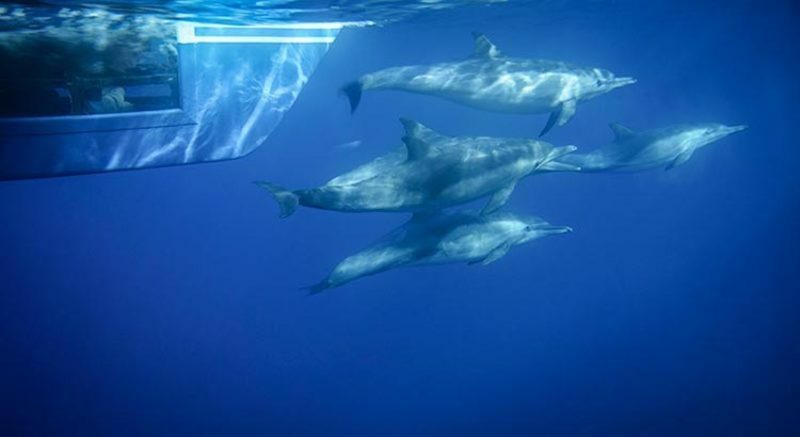 Live narration from entertaining and knowledgeable marine naturalists ensure an unforgettable Dana Point dolphin and whale watching voyage that adults and children of all ages will love. And at the end of every whale watching trip a sweet treat of Mrs. Capt. Dave's famously delicious Triple Fudge Brownies are served.